The Bald Cypress tree is one of the few trees in its family in which it loses all of its leaves in the winter. 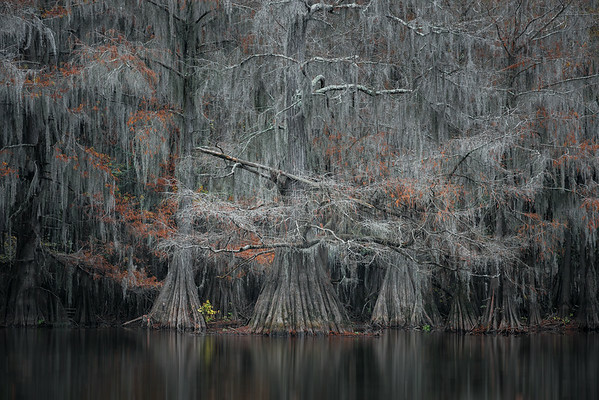 Here in the swamps of the Southern United States, the trees are filled with stringing moss, creating an entirely misty mood ... especially in the fall when the leaves of the Cypress start changing color and then eventually fall off. After a slight last minute alteration to our plan, David, Willie, Carolyn and I found ourselves at the first of a few swamps that we were going to visit. We arrived just after a large workshop had started to drop into the same lake we were visiting! Argh! Luckily we had arranged for kayaks to be waiting for us, we raced into them, and paddled to get ahead of the workshop. David, now the swamp master at this point, recommended Willie and I check out a particular side of the bayou, while he and Carolyn went to the other. We would paddle the kayak towards shore, get out of the kayak, setup the tripod, take pictures, get back in, and repeat. Eventually the light got bright enough that we could handhold the photos from within the kayak, without the constant get-in-and-get-out of the kayak. While paddling around I came across this tree and I loved the way the branch shot through the scene, as if by an arrow. I also kept hearing in my head: "Shot through the heart, and you're ok...."